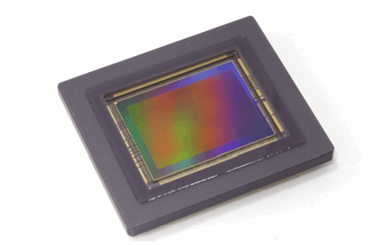 For several decades Canon, has been developing and manufacturing advanced sensors with state-of-the-art technologies for exclusive use in Canon products. The sensors are a driving force behind many successful products, from consumer products up to high-end business and industrial solutions. The 5 Megapixel Global Shutter CMOS Sensor is equipped with a global shutter that exposes all of the sensors’ pixels at the same time. This solid-state imaging sensor has dimensions of 2/3 inches, has a square pixel arrangement, and 5.33 million effective pixels (2592 x 2056). The sensor's global electronic shutter function contols the charge accumulation time and an all pixel progressive reading of 120 fps. The 19 μm FHD CMOS Sensor features high-sensitivity and low-noise imaging performance for the capture of full HD video in exceptionally low light environments. The larger pixel size of 19 μm x 19 μm alongside proprietary device design technologies helps to achieve higher sensitivity and an increased well depth. This 35mm CMOS sensor provides the largest 16:9 imaging area possible when used with Canon EF lenses. The 120 Megapixel CMOS Sensor has a pixel count equivalent to the approximate number of photoreceptor cells in the human eye. Recording capabilities at approximately 60x the full HD resolution of 1920 x 1080 is made possible by parallel signal processing, which reads signals at a high speed from multiple pixels. This sensor has a size of 29.22 mm x 20.20 mm, a square pixel arrangement of 2.2 μm x 2.2 μm with 122 million effective pixels, and 28 digital signal output channels. For more information on each model of Canon CMOS sensors such as additional features, specifications, and diagrams, download the individual brochures above.